“He stopped the railway coming to Hermanus.” Some residents of the town know that much about Sir William Hoy. Perhaps fewer know that he and his wife are buried on the crown of Hoy’s Koppie, at their own request and because it was Sir William’s favourite place to sit in the late afternoon, to survey Walker Bay and plan the next day’s fishing with his ghillie, Danie Woensdreght. “The S.A.R. Colossus”. Cartoon by Ferdi from The South African Railway Magazine, October 1911). But almost no one knows about his working life outside Hermanus, during which he left many notable legacies. From his base in the Cape Government Railways and, later, South African Railways and Harbours (SAR&H) he participated in some of the major international and national events of the first thirty years of the 20th century. 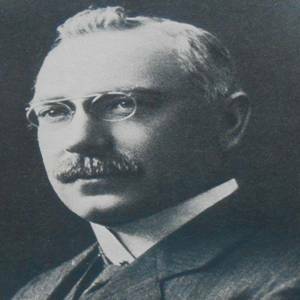 William Wilson Hoy was born on 11 March 1868, the eldest son of Robert and Mary Hoy, a farming family living at Arnot Mill, Portmoak, in Kinrosshire, Scotland. His family name is of Irish origin, being the Anglicized version of the Gaelic word meaning ‘heart’ or ‘spirit’. For financial reasons Hoy’s formal education was limited to the primary school grades and, at the age of 12, he began work as a junior clerk in the North British Railway Company in Edinburgh. He was immediately contributing to the family income and he was to work on the railways for the rest of his life. However, he possibly did not see sufficient avenues of advancement in Scotland, because, in 1889, he was recruited by the Cape Government Railways, emigrated to South Africa and took up employment in Cape Town. An authenticated anecdote reveals his character. While still in Scotland he became convinced that shorthand and typing would become very important in business and qualified himself in both. He brought his personal typewriter with him to South Africa, and it is thought to be the first ever used in business in the country. One commentator has jokingly claimed that Hoy was the first and only ‘shorthand-typist’ to become General Manager of South African Railways. In Cape Town, Hoy immediately attracted the attention of his superiors and in 1890, after only a year in their employ, he was invited to attend the official opening of the Cape Town to Free State line in Bloemfontein. For the next five years he held various fairly short-term appointments around the country during which he gained valuable knowledge of the various railways. 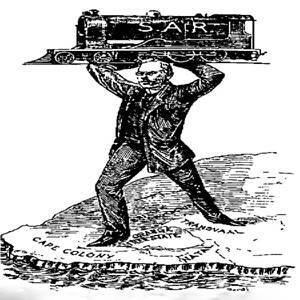 At that time both British colonies (the Cape Colony and Natal) had their own railways, as did the two independent Republics of the Orange Free State and the Transvaal. Several private railways had also been established. There were several different railway gauges (width of railway track) in use, meaning that goods had to be unloaded from one train at points where different gauges met and re-loaded onto another train. In 1895 Hoy returned to Cape Town as the General Manager of the Cape Government Railways. War between the two Boer Republics and Britain started in 1899 and in June 1900 Hoy was appointed Supervisor of the British Military Railway Network, based in Bloemfontein. He was 32 years old and essentially in charge of the most vital element of the British war effort. He held this position until the conclusion of hostilities and was famous for the speed with which sections of the lines in his area were repaired after having been damaged or destroyed by Boer forces. In 1901 he married Gertrude Mildred Price, daughter of Sir Thomas and Lady Price. Sir Thomas was Hoy’s immediate superior in the Cape Government Railway’s management structure. The couple had one daughter, Maudie. The family holidayed at Hermanus regularly from about 1903 and always stayed at the Marine Hotel, never buying a holiday home and never renting holiday accommodation elsewhere. 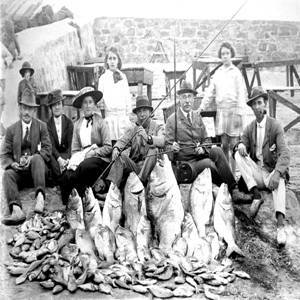 There are a number of photographic records of the family in Hermanus. In 1904 Hoy was appointed Chief Traffic Manager of the Central South African Railways, which was formed out of the Orange Free State and Transvaal railways after the Treaty of Vereeniging. He was instrumental in integrating these two sections with each other and then integrating them with the Cape and Natal railways. In 1910 he became the first General Manager of the new South African Railways. In 1914, at the outbreak of World War I the British Government requested South Africa to initiate military action against German forces in what was then German South West Africa (“GSWA” – now Namibia). Generals Botha and Smuts personally insisted on the appointment of Hoy as director of military railways, with the main task of managing the construction of more than 250km of new track into GSWA under severe time constraints. This was achieved with time to spare and the South African campaign was entirely successful. For this work, Hoy was knighted and made a Companion of the Most Honourable Order of the Bath in 1918. Hoy was now regarded as one of the finest strategic thinkers in South Africa, as well as an organiser of formidable talent. He began to be involved in political events. In 1919 he accompanied Botha and Smuts to the Versailles Peace Conference to advance South Africa’s interests. During this visit he received the Belgian Ordre de la Couronne and was created a Knight of Grace of the Order of St. John. He regularly represented South Africa at conferences of countries belonging to the British Empire and was present at the 1926 Conference, when South Africa became a ‘dominion’ within the British Empire. In the 1920s Hoy continued to develop the railway network in South Africa and to contribute to the industrialisation of the country. He was plunged into politics once again when Smuts called on his help with moving soldiers and materials during the 1922 Rand Rebellion. Among other achievements Hoy was a leader in developing the first coal-fired electricity generation station in Durban, publicising the newly-proclaimed Kruger National Park and com-missioning the now famous decorations by Pierneef for the Johannesburg Station. Sir William Hoy retired from the South African Railways in 1928 due to ill-health, and, after a brief period of illness, died in Hermanus on 11 February 1930. He is buried at the summit of Hoy’s Koppie in Hermanus. His wife who died in the United Kingdom in 1935 is buried alongside him.